Like many, Arron Carter was born curious. He's combined that trait with a strong belief in teamwork as he now works to feed millions. It started with a car, a ’69 Corvette Stingray to be exact. 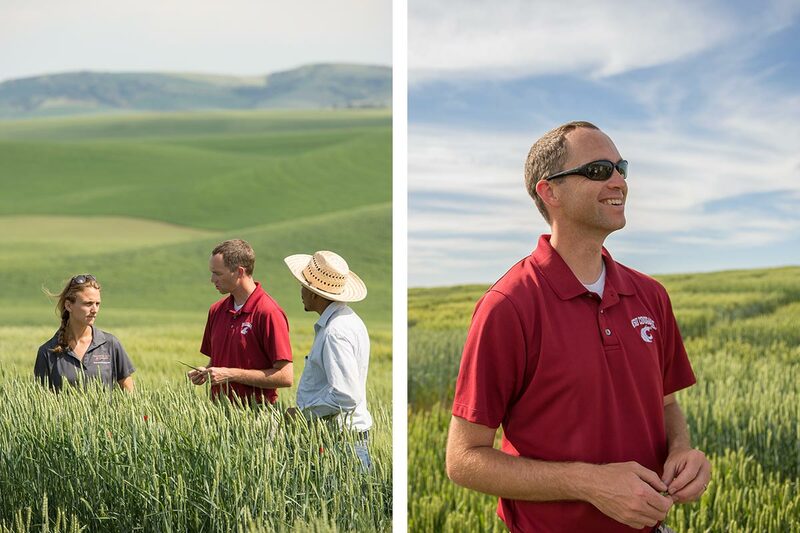 When Arron Carter, the director of the Washington State University Winter Wheat Breeding Program, was in high school his agricultural teacher had a ’69 Corvette Stingray. Every year this teacher would let his favorite senior take the car to senior prom. Carter had never taken an agriculture class before, but he knew he wanted to drive that car. Carter can’t exactly place where his interest in science came from, but like most kids he remembers being curious. He took things apart to see how they worked and put them back together–or at least attempted to put them back together. This natural curiosity heightened when he started school. Instead of forcing him to read a boring textbook or memorize random facts, Carter’s teachers would let him conduct his own research and find the topics that interested him. Along with his parents, Carter credits his science teachers as some of his biggest influencers. Carter’s first agriculture class was no different. In some ways, it was even better, he explains. The class required more applied research and gave Carter the opportunity to apply his love of math and science to real-world issues involving plants. He quickly found his passion. After high school Carter wanted to continue his work with plants. Growing up in Kimberly, Idaho, he had the opportunity to work with the scientists at the University of Idaho Research Center just outside of town. After graduating from high school, he looked for a university with a strong plant science programs and settled on the University of Idaho. It was a happy coincidence that his freshman advisor was also the wheat breeder for the university. The breeder offered Carter work and for the first couple years he was hoeing out weeds and washing glassware in the lab. The work helped him learn more about plant breeding. By the end of his undergraduate career, Carter decided he could work in plant breeding for the rest of his life. Although he loves his career now, Carter admits the decision to work with wheat was a bit of a fluke. Prior to his acceptance to the University of Idaho, he hadn’t thought much about what kind of plants he wanted to work with. Luckily, UI’s location in one of the most productive wheat growing regions in the nation led Carter to his calling. The process of breeding new varieties of wheat has a prominent place in history. Humans began domesticating wheat about 8,000 to 10,000 years ago and specifically bred for traits like stronger stems, earlier maturation times, and non-shattering heads. While there have been many success in Carter’s career, there have also been instances where a new variety just wasn’t successful in the field. Though some would call these varieties “failures,” Carter sees them as learning opportunities. They have helped him figure out what genes are susceptible to disease or environmental stress and exactly how to combine these genes to make a successful variety. After earning his bachelor’s and master’s in plant science from UI, Carter sought further education at WSU. As he was finishing his Ph.D. in crop science at WSU, positions working with wheat were few and far between. At the time, most of the jobs in his field were in the private sector, which was much more interested in corn and soybeans. Carter faced the difficult decision to stick with wheat or move on. Luckily, both the spring and winter wheat breeders at WSU took administrative jobs, leaving their positions open. Carter applied for and accepted the position as the WSU winter wheat breeder in July 2009. When he started new job, Carter wasn’t fully aware the history of the WSU wheat breeding program. Founded by William Jasper Spillman in 1894, the program has had only six winter wheat breeders in its 120-plus years. When a wheat breeder arrives at WSU, he or she makes a career out of it. And that career seems to last long past retirement. Collaboration and teamwork is common in the WSU breeding program. In addition to the winter wheat program, WSU houses a spring wheat breeding program and a USDA-funded breeding program. 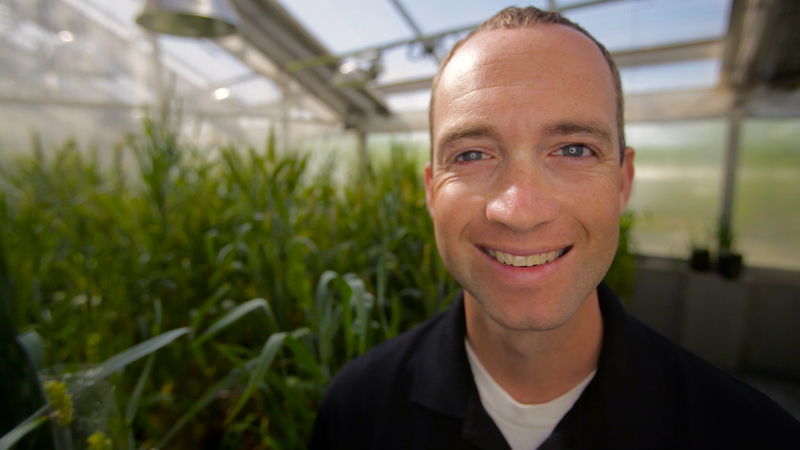 Carter works with other wheat breeders and scientists at WSU, including molecular geneticists, plant pathologists, weed scientists, and more. WSU also fosters an environment in which researchers share resources and equipment to ensure every scientist has what he or she needs to be successful, Carter points out. When creating a new variety of wheat, Carter usually focuses on specific factors like disease resistance and tolerance to environmental stress. However, these factors are just small steps toward a much larger end goal. But, according to Carter, there are a lot of different ways to go about ensuring high yield potential. In the Pacific Northwest, wheat growers always face the double threats of fungal disease called stripe rust and drought. To give wheat disease resistance and drought tolerance, Carter and his team need to understand exactly what in the plant’s DNA creates resistance. First, he identifies DNA markers within known disease resistant wheat varieties, and then uses this information to screen other varieties for resistance, similar to how medical professionals screen for breast cancer. This helps him eliminate non-resistant varieties, saving time and resources later in the process. Field screening and testing is often conducted in local cooperating farmers’ fields, making the relationship between the wheat breeders and growers mutually beneficial. This relationship also helps breeders understand exactly what the grower needs from a new variety, he says. To Carter, the WSU breeding programs are more of a collective rather than stand-alone programs—a collective made up of breeders, scientists, growers, and consumers. So when the programs released their 100th variety, the decision on how to celebrate involved everyone. A spring wheat breeder suggested naming it in honor of the very first wheat breeder, William Jasper Spillman. There already was a variety named Spillman, so the group agreed to name the new variety Jasper. Working at WSU also provides Carter with numerous interactions with students. However, just as he himself learned, the field of plant sciences is big, student opportunities in crop science are abundant, and finding a niche can be daunting. So when a student joins the team, Carter and his colleagues strive to help the student find his or her passion. Students can pursue academic research, the private sector, non-profits, and more. With this in mind, Carter and his team tailor internship experiences to fit the students’ interests. Their goal is to provide useful hands-on learning opportunities. Demand is currently high for students with crop and plant science educations due to a global need for more plant breeders. The world needs to figure out how it’s going to feed a growing population. In the past students have avoided agricultural fields because they thought agriculture meant working on a farm. They’ve quickly learned plant science is much broader than that.